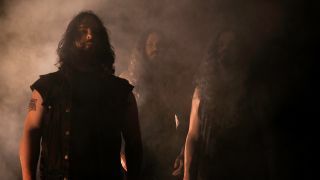 Wolves In The Throne Room are premiering their new track Mother Owl, Father Ocean exclusively with Metal Hammer. It is the ambient companion track to the previously released Angrboda, which plays at the beginning of the stream below. Both songs are part of a duet with Swedish musician Anna Von Hausswolff. Speaking to Metal Hammer, Wolves In The Throne Room’s drummer Aaron Weaver described making music with Anna as a “true gift. Angrboda and Mother Owl, Father Ocean are taken from Wolves In The Throne Room’s upcoming album Thrice Woven, which will be released on September 22 via Artemisia Records. Thrice Woven is available to pre-order now.